August 10, 2017 (Lincolnshire, Ill.) – Klein Tools today announced new results from its annual “State of the Industry” survey, with input from more than 600 union and non-union electricians. Survey results suggest that electricians are still concerned about the skills gap in the electrical industry and have seen more experienced electricians leaving the field. Many skilled electricians cite physical demands and insufficient continuing education opportunities as reasons they have pursued other careers. Results showed that the majority of electricians, 56 percent, have noticed more electricians leaving the field over the past few years, compared to 44 percent in 2015. Nearly two-thirds of electricians who have less than 20 years of experience have seen an increase in experienced electricians leaving the field, with a significant increase among those with 10-19 years of experience. Forty percent of electricians are concerned that not enough qualified workers will be available over the next five to 10 years. “It’s concerning that electricians are seeing fewer experienced skilled workers on job sites,” says Mark Klein, co-president of Klein Tools. “As part of the solution to this problem, we need to continue to educate the younger generation on the many benefits a skilled trade job offers, including job flexibility, potentially high wages and the opportunity for creativity and pride of ownership. It is also essential that we continue to advocate for more technical and vocational academic programming to increase student engagement and give students the opportunities to explore careers in the trades. 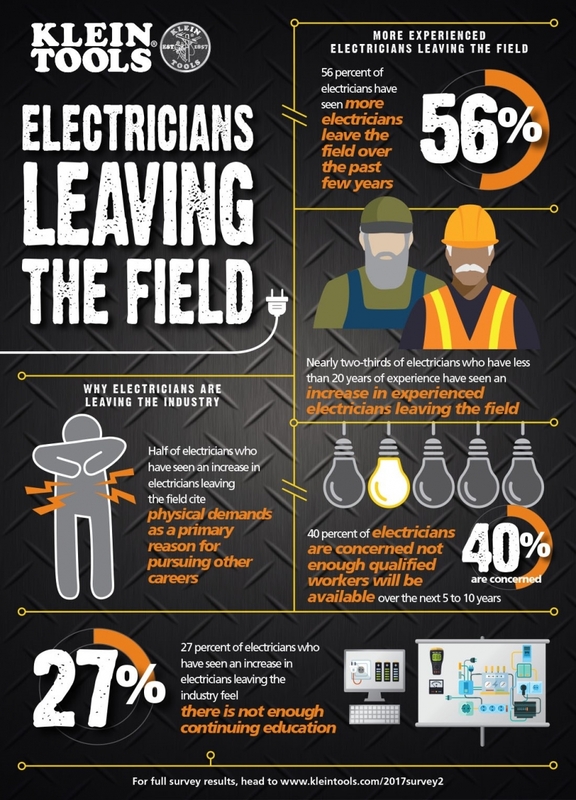 This year’s survey found several reasons electricians are deciding to leave the field. Half of electricians who have seen an increase in electricians leaving the field cite physical demands as a primary reason for pursuing other careers. Twenty-seven percent of electricians who have seen an increase in electricians leaving the industry feel there is not enough continuing education. This is significantly higher than findings from the past two years. “Klein Tools knows the physical demands of electrical work well and we strive to ensure our products allow for less strain on job sites,” Klein says. “We are working hard to continue to develop and manufacture multi-functional tools that can eliminate some of the daily strain and keep electricians working longer in the field. From our Heavy-Duty Wire Stripper to our new line of Slide Driver products, Klein Tools is helping electricians stay healthy and effective on the job. More than 600 union and non-union electricians were surveyed for the Klein Tools “State of the Industry” survey by Russell Research, an independent survey research firm. Russell Research conducted 201 online interviews from Jan. 20-26, 2015; 200 online interviews from Jan. 27-Feb. 5, 2016; and 200 online interviews from Jan. 10-18, 2017, to secure a nationally significant representation. Forty percent of respondents were union members and 60 percent were not. 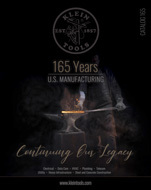 Since 1857, Klein Tools, a family-owned and operated company, has been designing, developing and manufacturing premium-quality, professional-grade hand tools. The majority of Klein tools are manufactured in plants throughout the United States and are the number one choice among professional electricians and other tradespeople. For more information, visit www.kleintools.com.